Mini ratchet set 27in1, the optimal companion in the world of fine mechanics, in which a screw quickly has to be tightened, loosened or re-screwed. The included universal tool set 27in1 allows you to access a variety of fine-mechanical tools at once. Have the right screwdriver at hand in the fastest and easiest way. 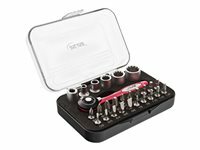 Socket set - 27 pieces - 1/4"